The ministry of Gospel Recordings was founded in Los Angeles in 1937. At that time Joy Ridderhof lay on her sickbed after returning from her time as a missionary in Honduras. All she felt was a deep sense of disappointment and sorrow at having to leave her beloved converts behind - people who in most cases were unable to read or write and relied on a verbal message to bring them to a saving knowledge of Christ. If only she could have left behind recorded messages in their native Spanish, how wonderful a legacy! In this way the existing converts could be built up in their faith and other people reached ... after all, "faith comes by hearing and hearing by the Word of God." Thanks to several friends' generosity, Joy was able to see the beginning of this coming to fruition as she recorded the first gospel record in Spanish in the last day of 1938. What started out as a trickle soon became a veritable flood as enquiries for the Spanish records started coming in thick and fast not only from Honduras, but increasingly from other Spanish-speaking countries in Central and South America, as well. A turning point was reached in 1940. Joy was asked to make a number of gospel recordings for the Navajo Indians in Arizona. Each additional language would lead to requests for more languages to be recorded. She agreed, and so began the fulfilment of the wider commission - to take the gospel to the ends of the earth. Gospel Recordings has developed into an international mission with centers and bases in over 30 countries. Recording work is done in makeshift recording studios in church buildings, classrooms, or just out under a tree. This material then has to be edited and have some music or songs added to it, to make it ready for distribution. Distribution is done by teams of people moving from village to village, or through missions or churches that have been established in the particular language area. 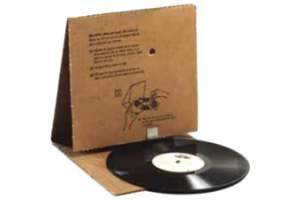 Recordings are also played or made available in clinics, schools and in market places. Villagers hear (in many cases for the first time), the Word of Life - and in a language that they fully understand. The Mission is constantly seeking to update its equipment and methods so that people might be more effectively reached; there are thousands more new recordings to be made and older ones to be updated; new Recordists to be trained; and new distribution methods such as mobile technologies to be developed. Please support the work of GRN by praying for the Members serving around the world, and for the projects in which they are involved. Pray also for a constant flow of new workers to carry on the task. There is so much yet to be done to bring the gospel to every tribe and tongue and it can only be done with the prayer support of God's faithful people. 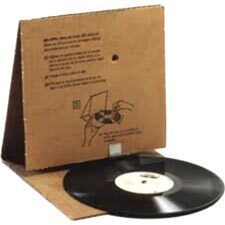 The simple but ingenious CardTalk cardboard player was developed to play phonograph records without electricity. Brief History of GRN - Since 1939 GRN has been working to reach the smallest language groups with the Good News of Jesus Christ in their own language through audio recordings.